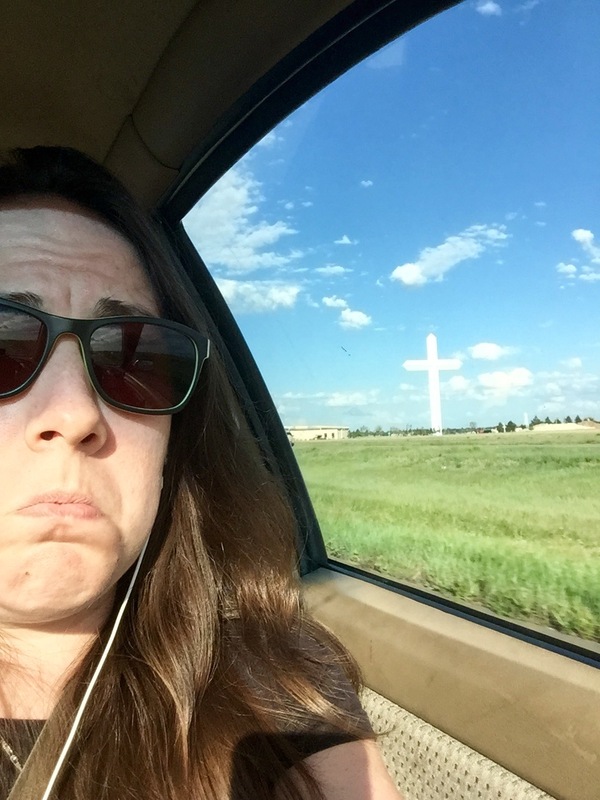 Apparently this is the Largest Cross in the Western Hemisphere… East Coast, take note. Made it to Amarillo, Texas in one piece (though I am a little scarred already). This is going to be a brief update, as I don’t have access to wifi at the house I’m surfing at today (I’m using my phone’s hotspot). I’ll do something more extensive later today or tomorrow. Oklahoma was far greener and prettier than I could have possibly imagined. Apparently, there has been a ton of rain in the last couple weeks, so it was unseasonably green. The rolling hills of Eastern Oklahoma slowly blended into the flatter plains and scrub of Western Oklahoma right as I dumped into Texas (I’ve finally made it to I-40 y’all). Couchsurfed with the lovely Angela, her two daughters, and three dachshunds. Got my own room and everything, so I feel very spoiled. Today’s goal is Laughlin, NV (via Route 66). Who can say no to a $15 hotel room ON A BOAT?? Like I said, I’ll do a far longer post later, including trip stats. Music yesterday included Walk the Moon, Foo Fighters, matchbox twenty, and MuteMath. Peace, Love, and *cough*Signal Boost*cough*! This entry was posted in Academia, Dissertation, Driving, Research, Road Trip 2015, travel and tagged 2.2 L Subaru, I-40, Interstate 40, Missouri, Okalahoma, Road Trip, Subaru, Subaru Impreza, Subaru Impreza Brighton, Subaru Love, Subaru Love Campaign, Texas. Bookmark the permalink. Disclaimer: The thoughts and contents contents of this website are my views alone and do not constitute a representation of any of my employers or academic affiliations past or present.